We had heard a lot of hype about how delicious these 2 ingredient pumpkin spice muffins are and to be honest we weren't so sure they sounded that great but we were wrong - they are delicious! So you may be wondering how to make 2 ingredient pumpkin spice muffins and we are here to let you know how easy it is, all you need is a box of spice cake mix (we used Betty Crocker) and a 15 oz. can of pumpkin (we used Libby's). Simply mix the dry cake mix and pumpkin together in a bowl. You will be making 12 muffins so you'll either want to grease your muffin tin cups or use paper liners - we used paper liners. Simply divide the muffin batter evenly among the 12 muffin cups. Preheat your oven to 350 degrees. You will bake your muffins at 350 degrees for 20 to 25 minutes. You can use a toothpick to make sure they are done (to test, use a toothpick by poking one of the muffins with the toothpick and if the toothpick comes out clean, the muffins are done baking). Wait for the muffins to cool and serve. 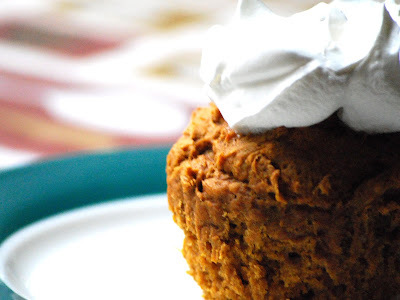 We find that the muffins are even better with a little bit of whip topping added.